Some of the most joyful Christians I’ve ever met live in Haiti. When I first started visiting the Western hemisphere’s poorest nation decades ago, I was captivated by church services where everyone danced with glee. If you didn’t dance, you felt strange. I danced. It was wonderful to have so much fun at church. Haiti’s Christians are still dancing—in spite of the earthquake that rocked their capital in January. As you are reading this, three of our staff members are there, checking up on our orphanages and a resettlement camp where the Lord is helping us to sustain about 1,800 believers who lost what little they had. Our team is marveling at the joy they are finding among saints who are content with food and covering. I could not help thinking of Job, the biblical man, as I spoke with Antoine Petit. I had been walking through the makeshift camp where hundreds of earthquake survivors from several Port-au-Prince churches had resettled. As I was trying to capture some scenes on my video camera, he stopped me and asked a question in English: “Where are you from?” Feeling somewhat uncomfortable about being from a land of luxury as I walked among hundreds of poor Christians who had just lost what little they owned, I hesitatingly admitted that I was from the U.S. Then I quickly explained that I had come to bring help. Antoine expressed his thanks. Because his English was so good and his disposition seemed so positive, I asked him if I could interview him on film for my friends back home. He agreed, and so I aimed my video camera at him and pressed the “record” button. I was unprepared for what I was about to hear. I soon learned that Antoine and his wife had been at home with their four teenage children when the earthquake struck nine days earlier. He, his wife, and one of their daughters had escaped unharmed. The bodies of his other three children were still buried beneath the rubble of his former home. I was stunned by his report, and I suddenly felt like an intrusive, insensitive photojournalist. I wondered how he could relate his tragedy without breaking down in tears. I told him that I was very sorry for him and, feeling increasingly uncomfortable about filming him, I struggled to find a redeeming question. “Were your children followers of Jesus?” “Yes,” he replied, and I assured him of what he was obviously certain. “They are all in heaven now.” But my condolences seemed hopelessly inadequate. As Antoine continued telling me additional heartbreaking details of his story, I continued to wonder why he was not downcast. He repeatedly told me that he “felt power,” and it took a while before I understood that he was trying to express how the power of the Holy Spirit was working in his heart. I stood amazed. He had lost three children, his home, and most of his material possessions. He was sleeping on the ground each night. Yet he had joy. I wondered if his wife was handling their tragedy equally as well. He called her from nearby. When I saw her, I regretted asking Antoine about her. Her eyes were filled with sorrow. She was in mourning. I was a clod pointing a video camera at her. Antoine asked her in Creole to tell me how she was feeling. She lifted her head, but looked far away. She spoke two quiet sentences in Creole, and her head fell again. Antoine translated: “The Lord giveth, and the Lord taketh away. Blessed be His name.” At that moment, I felt I was standing on holy ground, unworthily, with two people of much greater faith who are destined for better things in eternity. How could we not come to their aid? The Bigger Picture: Since then, Heaven’s Family has been a daily lifeline to the 1,800 members of our spiritual family who are living together at that resettlement camp. We’ve been providing safe water, food, shelter, medical care and more, at the rate of about $3,000 a week. We’re also working to help them become self-sustaining through income-generation projects. Your compassionate gifts to the Disaster Relief Fund are making this possible. David and Josephine Nyabenda, of Burundi, East Africa, could come up with no other solution to escape their misery. They and their children were starving. Because of his physical handicap, David had no choice but to beg in the streets. Today a man had spit in his face. How could things be worse? So David and Josephine began discussing plans to kill their three children and commit suicide. Because of a gunshot wound he’d suffered during Burundi’s civil war, David’s left leg had been amputated below the knee. From that day, begging was his only option if he and his family were to survive in one of the world’s poorest nations. It was, however, demeaning. One morning a man from whom he had requested money angrily said to David, “Why don’t you get a job and work?” David replied, “I have nothing I can do. But if you give me a job I can do with only one leg, I will show you that I can make something of my life.” The man responded, “Am I your god that I can give you a job?” He then spit on David’s face and walked away. David would never forget that day or that man. Death seemed better than life. During the time David and Josephine were making their suicidal plans, a Heaven’s Family-sponsored native missionary named Bienvenu befriended him on the streets while he was begging. Bienvenu led David to the Lord, and his life was changed. David hobbled home and told his wife what had happened to him. She repented and believed. Together, they soon joined a small house church that Bienvenu had planted, and they won several of their neighbors to the Lord. The Bigger Picture: The Handicapped Christians Fund was created to help our spiritual family members, like David, to become self-sufficient. We currently have a waiting list of handicapped brothers and sisters in Christ in Burundi who are surviving by begging and whom we want to help start sustainable small businesses. “Apocalyptic” was the word that spilled from the lips of one of our team members as our van jostled through cars, trucks, UN vehicles, and throngs of despairing people. We were navigating the streets of Port-au-Prince just nine days after the devastating earthquake rocked the poverty-stricken island nation. Television images had not prepared us for the horrific scenes we encountered as we drove past building after building that lay in ruins. The unmistakeable smell of decay bore silent witness to those piles of rubble where bodies still lay entombed. Our destination was Mt. Zion Orphanage. Although we’d heard an unconfirmed report just days earlier that some of the orphans were unaccounted for and feared dead, we made this final leg of our journey comforted by recently learning that all were alive and well. We turned up the final street towards the orphanage, only to find it blocked — like many other side streets we passed — by survivors camped out in the only space they could find outside their tightly-spaced homes. The many aftershocks (almost fifty within two weeks of the original quake) caused most to fear moving back into their homes — if their homes were still standing. After detouring a few blocks we finally arrived. Eleven orphans, the director, Widelson, and his wife Marie, and a few of their neighbors greeted us as we climbed out of our van. Our joy at seeing their faces was only magnified when we learned that God timed our visit perfectly: high food prices following the quake had prematurely exhausted their supply that very morning. We praised God that we were able to hand Marie several hundred dollars given to the Heaven’s Family Disaster Relief Fund by caring members of Jesus’ family like you. She immediately sent someone to buy food for everyone. The small concrete house where Widelson, his family, and eleven orphans live, had not been damaged by the earthquake in the least, even though it stood about one mile from the earthquake’s epicenter. As we began to say our goodbyes, some of the orphans clung to our arms crying out, “Please take us with you!” The ongoing tremors filled them with fear. Our hearts broke when we had to depart without them. Leaving was painful, but we were comforted knowing that when we returned home we could link arms with our spiritual family to become a lifeline of love and hope for the orphans of Mt. Zion. “Those who trust in the Lord are like Mt. Zion, which cannot be shaken but endures forever” (Ps 125:1). The Bigger Picture: All of the children at Mt. Zion Orphanage have been blessed with monthly sponsors through our Orphan’s Tear division. Hundreds of other orphans, however, in seven other nations are waiting for sponsors. Just $20 per month provides food, clothing, shelter, school fees and Christian nurture. You can find your child waiting at OrphansTear.org. The 1970s were a time in the nation of Burundi, East Africa, when Christians were suffering persecution. Local authorities and Catholic Church leaders were afraid of what they perceived to be a radical movement. Rumors swirled that the believers were of a cannibal sect, and rebels to the laws of the state. It was then that Vincent Banyiyezako, a young man, gave his life to Jesus and became a zealous follower. In spite of the persecution, believers were resolute in their desire to obey the teachings of Jesus. They met clandestinely in homes, in mountain hideaways, and at night. Many came to Christ as the gospel was proclaimed, calling new believers to a willingness to suffer for the sake of the kingdom. Though they made mistakes in their zeal for the Lord, many miracles occurred. Unfortunately, the fire did not burn for long. Tragically, a growing influx of certain western missionaries quenched the fire. As persecution subsided, believers were encouraged to attend Bible schools to study liturgy and homiletics. Those with ministry credentials were promoted over those whom God had gifted, and business ventures were promoted while spiritual matters suffered. Vincent was caught in the compromise. He became a pastor and eventually a “bishop,” more concerned with maintaining and controlling his congregation than with making disciples of Jesus. He enjoyed a comfortable life. The decades rolled by. One day, Bishop Vincent was invited to a pastors’ conference hosted by a friend of Heaven’s Family, Burundian Bienvenu Bizimana. He was unprepared for what the Holy Spirit had in mind. Vincent was challenged by biblical truth, as Bienvenu taught simple biblical principles he had garnered from David Servant’s book, The Disciple-Making Minister. Bishop Vincent’s eyes were opened, taking him back to the early days of his salvation when following Jesus was all that mattered. He openly repented before the other pastors and proclaimed he would begin making disciples once again, following his true calling to be a servant. He confessed, however, that he was worried about backlash from parishioners and denominational leaders. On the second day of the conference, Pastor Vincent announced that God had confronted him at night and conquered his fear. He was ready, in God’s strength, to take up his cross. The Bigger Picture: Because of your gifts to the Books for Pastors Fund, Heaven’s Family has printed nearly 130,000 copies of The Disciple-Making Minister in 20 different languages. Thank you for helping to equip and encourage tens of thousands of pastors around the world like servant Vincent Banyiyezako. 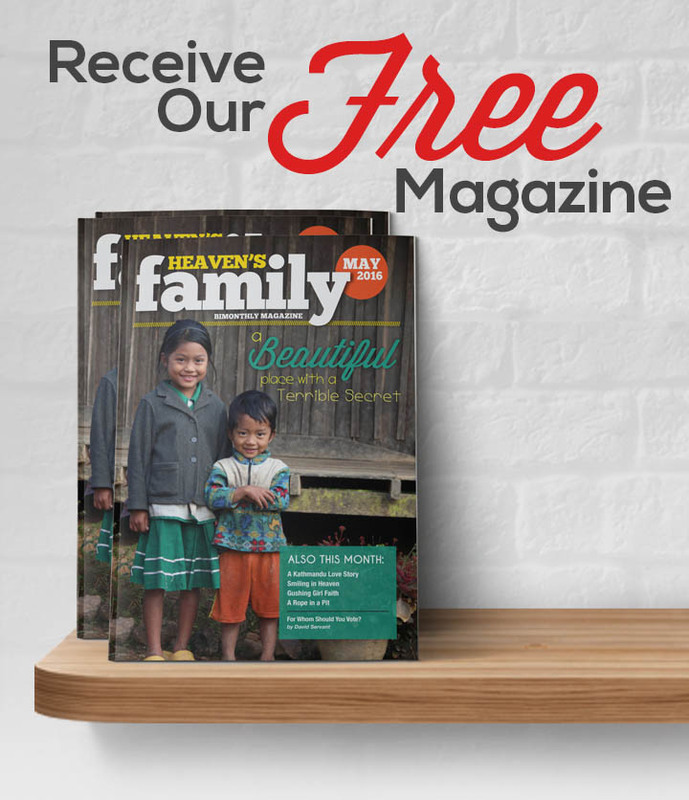 Is God Calling You to Work at Heaven’s Family? Is there any significance found in the facts that Jesus had twelve apostles and Heaven’s Family now has twelve employees? That is highly unlikely. Yet there are some similarities between those twelve and the twelve of us. Like them, we’ve felt Jesus’ call. Like them, we’re on a path of learning. And like one of them, some of us feel like we’re walking on water. Two people who have just begun their water-walk with us are Jeff and Karin Trotter. They officially joined us in January, bringing their love for Jesus and the gifts He’s placed within them for administration and communication. They’re being supported by friends and relatives, trusting that “God’s will is God’s bill,” a newer version of the old truism, “Where God guides, God provides.” Jeff is taking responsibility for our I Was Hungry Division plus directing several restricted funds. Karin is also directing several special funds as well as helping to administrate our Orphan’s Tear Division. I’m glad God has sent them. I always hope that our work load will lighten with the addition of each new staff member, but it seems that the Lord keeps giving us more to do. Consequently, we still need more help in our Pittsburgh office. That being said, if you have a sense that the Lord might be calling you to serve “the least of these” by working at Heaven’s Family, I’d like to hear from you. Before you do write, however, there are four preliminary steps to take. First, you should carefully study what you find at HeavensFamily.org to become knowledgeable of our ministry and its three divisions: Shepherd Serve, I Was Hungry, and Orphan’s Tear. You should read The Disciple-Making Minister and The Great Gospel Deception (both posted on our Shepherd Serve website), as those books contain biblical principles that reflect our core beliefs. It is essential that you understand and identify with those core beliefs. The second step is to honestly evaluate your character. Jesus must be Lord of your life, and you must be one of His disciples. Your life must already reflect those things, evidenced by sacrificial deeds of love for His body. You must be honest, humble, hard-working, missions-minded, and a team player. Heaven’s Family is not place for lone rangers. It is a place for servants. Heaven’s Family is like numerous other mission organizations—many of our staff raise some or all of their own personal support. So the third step is to honestly evaluate if you can be self-supported, either from your own resources, or by means of raising your support from your church, family and friends. We can certainly advise you concerning that process. But you must evaluate if you have a network of people who would likely be willing to support you financially if you dedicated yourself to serve at Heaven’s Family. Fourth, you must be willing to relocate to Pittsburgh, Pennsylvania, which isn’t so bad. The community where our offices are located was rated by U.S. News as being one of the best places to live in America! In 2007, Pittsburgh was rated as America’s most livable city! If you believe that you are a good candidate, the fifth step is to email your résumé with a cover letter to [email protected]). We will review your résumé and reply within two weeks. If we are interested in further exploring the possibility of your joining our Pittsburgh-based staff, we will ask for letters of recommendation from those who know you and request that you come for an interview. We like to date before we get married! Working for Heaven’s Family is a calling that is not for everyone. If God calls and sends you, however, we want you! Heaven’s Family has so many worthy projects that our friends sometimes have trouble deciding where to designate their contributions. For them, we’ve created the Heaven’s Family Mutual Fund. Each monthly “share” of $45 is divided among Heaven’s Family’s three divisions: Orphan’s Tear, I Was Hungry and Shepherd Serve. $20 supports one orphan, $15 meets some of the most pressing needs from among the I Was Hungry family of funds, and $10 puts copies of The Disciple-Making Minister into the hands of pastors all over the world. To learn more or start investing, visit www.heavensfamily.org/mutual_fund. Including Heaven’s Family as a Charity Beneficiary in Your Life Insurance Policy — Explore one of the more obvious but also one of the most over-looked ways of investing your material wealth in eternity after you have passed away. David Warnock explores the exciting possibilities of designating a charity, such as Heaven’s Family, as a beneficiary in your life insurance policy. Read More.